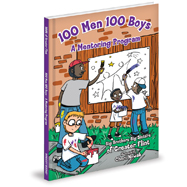 The 100 Men 100 Boys Program is at it again! The boys and their mentors are on a mission to help educate, beautify, and to bring fun and laughter to their wonderful community. The boys and their mentors take a trip to the local college to find out what kind of job would interest them when they grow up. During the summer, the boys cool off by splashing around in the pool. In the fall, when the leaves drop from the trees, the boys are there to help the elderly rake their yards. When the snow is covering the ground, the boys hit the ice skating rink and twirl around. By the time spring rolls around, the boys are ready to grab some shovels and start planting beautiful flowers around the neighborhood. No matter the season, the 100 Men 100 Boys Program is here to have fun and to lend a helping hand to Greater Flint!